Over 8 million jobs have been lost in the United States since the current recession officially started in December 2007 and in Canada over 400,000 full-time jobs have been lost. Under these circumstances, laid off workers are discovering that it is almost impossible to find work. Meanwhile, students who are graduating from school, college or university are facing challenges like never before. In spite of the "happy pills" currently being dispensed by politicians and so-called pundits, 2010 is likely to be a very tough year due to continuing high levels of unemployment, a further slide in US home prices caused by foreclosures and people exercising more care about spending money; not to mention another lurking financial crisis brought about by the collapse in the commercial real estate market. As the US’s largest trading partner, Canada will share the pain. And, when conditions finally start to improve, governments on both sides of the border will struggle to pay down record deficits, increase taxes and thereby put a damper on any serious recovery for several more years to come. Against this dismal background, the "traditional" salaried job market will continue to remain on life-support and offer little comfort to those whose immediate need is to put food on the table and a roof over their heads. On the other hand, "self-employment" offers a practical alternative to the "not hiring" notices posted by most major employers. As this book demonstrates, self-employment requires a lot of sacrifice and determination to succeed, however, for many, it may be the only practical alternative to living on welfare and standing in long line-ups at soup kitchens. Self-Employment for Beginners covers a wide spectrum of potential areas for self-employment and helps readers explore those which are most likely to survive in a hostile economy. It will help them assess themselves and their strengths and weaknesses. It will recommend courses or training to plug the gaps in their knowledge and prepare them before taking the plunge. This book shows readers how to advertise and market themselves; their products and their skills. Good customer relationship management is essential and this book reviews computer software to help readers implement it. Finally, readers can learn about some of the legal and tax issues they will face. They can take a tour of introductory level accounting software that will help them keep their books in order. Finally, they can take a look at micro-loans together with some government assistance that is available. For all those thinking of self-employment, this book will help to set them on the right track. Chapter 2 - Is an End in Sight? Chapter 3 - What do we Mean by Self-employment? 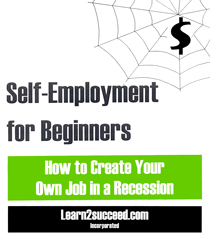 Self-Employment for Beginners: How to Create Your Own Job in a Recession by: Learn2succeed.com Incorporated: softcover; 142 pages; ISBN: 978-1-55270-382-3; published in March 2010; $24.95.